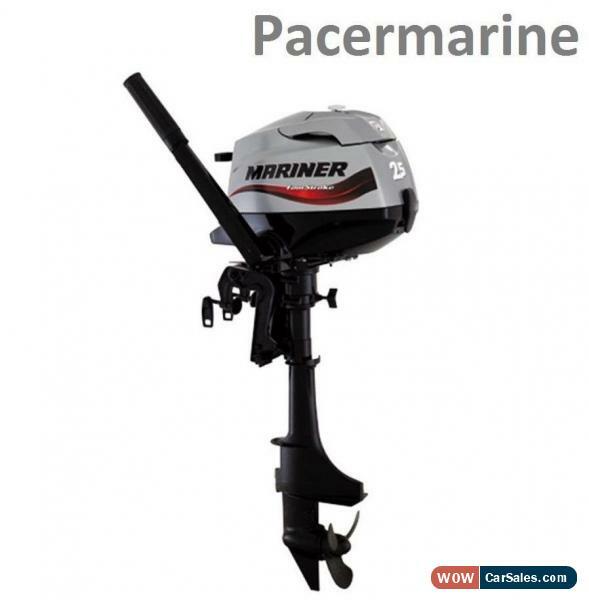 BUY WITH CONFIDENCE FROM US MAIN MARINER MERCURY DEALERAll our engines are PDI'd, re-packed and supplied with the correct oil.Mariner F2.5M 2015 models Sale Pacer Marine is an approved Mariner dealer. All engines are PDI’d, re-packed and supplied with the correct oil. This F2.5M MARINER outboard is part of the lightweight and portable range of four-stroke outboards. With clean, quiet and fuel-efficient performance, it’s lightweight yet durable materials make these engines easier than ever to handle. Also featuring water-cooling with thermostatic control, ensuring dependable and reliable operation. Reliability CDI ignition offers maintenance-free dependability, and easy starting Superior Corrosion Protection provides longer life. The Performance Large displacement engine delivers excellent low to mid-range power, and also quiet, smooth-running and smoke-free operation. Running Quality Trim positions plus shallow water drive allows easy access to remote areas, and vibration isolated twist grip throttle provides smooth interaction with the engine. This engine also features technology visual low pressure warning system and decompression system for quick, effortless one hand starting. TECHNICAL SPECIFICATIONS: RPM at Full Throttle 5000 – 6000Cylinders Displacement 85ccStarting Manual Gear Ratio 2.15:1Steering TillerTrim Positions 4Weight 17 kgManual StartForward and Neutral GearsIntegral 1.3ltr fuel tankRecommended Transom Height SHORT SHAFTInduction System 2-valvePlease note: FREE Year Warranty – Five-year limited non-declining, factory-backed. Conditions and exclusions apply.Not applicable for commercial and racing applications.Free Postage and Packing to UK mainland only. If you are unsure if this applies to your location, please contact us for more information.